Ugly Duckling Presse is seeking to fill two part-time paid apprenticeships to begin March 2019. Working closely with the UDP Collective, apprentices will undertake important and varied work while learning how a small press operates from every angle and helping to shepherd UDP titles through the editorial, production, and publicity process. Apprentices play an essential role in running a small press on the day-to-day: from packaging and mailing books, preparing promotional materials, and website maintenance, to executing publicity initiatives and providing production assistance. However, apprentices’ tasks are not limited to in-house administration: they also contribute essential design and editorial work for a range of projects, and work with a high degree of creative and professional flexibility on self-guided projects. Ideal candidates will be exceptionally detail-oriented, organized, and able to self-direct in accordance with time sensitive schedules. Apprentices must be communicative and open to constructive feedback, passionate about the arts and poetry in particular, and comfortable working in a fast-paced environment while juggling diverse responsibilities. We especially welcome applications from people of color, with disabilities, and of the LGBTQ community. Apprentices commit to two days per week in the UDP studio, as well as assisting at occasional events, book fairs, and our open-house volunteer days. Apprenticeships are for 15 hours per week at $15/hour. February 11, 2019. Please indicate that you are applying for the March 2019 Apprenticeship in the subject line. 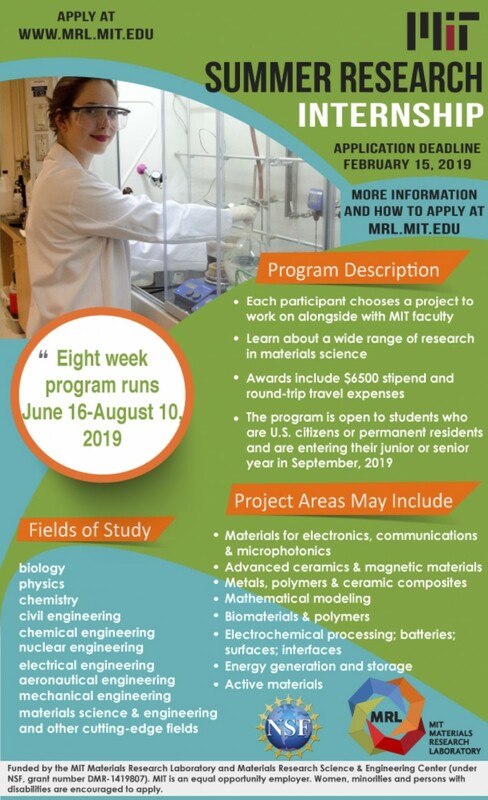 The MIT Materials Research Laboratory and the Materials Research Science & Engineering Center sponsor a summer research internship program for rising junior and senior undergraduates in the science and engineering fields. We would be grateful if you would bring it to the attention of your students by posting or forwarding the attached flyer where your students will see it, or pass it on to an appropriate department for posting. This challenging program brings promising students to MIT to learn and perform research in laboratories in a broad selection of materials science subfields. In addition to providing a stipend and round-trip travel expenses, we host presentations and group discussions on topics relevant to materials scientists, such as graduate school, careers in materials science, creating effective poster presentations, and management of intellectual property. At the conclusion of the program, the students present their individual research results at a poster session. The summer research internship, offered each year since 1983, affords students an invaluable experience in top-notch cutting edge research. The summer scholars program is funded by the National Science Foundation REU program (grant number DMR-1419807). MIT is an equal opportunity employer. Women, minorities and persons with disabilities are encouraged to apply. CUNY Arts offers resources for students interested in arts and culture in New York. This is a great resource to find out about opportunities throughout the city. But it’s also a great resource to find out about internships at various arts and cultural institutions throughout the city! Browse through the different institutions with opportunities for jobs, internships, and volunteering. Be sure to click on each borough to see the full range of opportunities! While you’re on the site, be sure to check out all the arts and cultural institutions that offer free or discounted admission with a CUNY ID–what a great way to spend Winter Break! Description: Are you interested in youth organizing? Do you want to be part of a growing youth activist movement? Are you interested in having a voice on school policies affecting YOUth? Do you think you deserve a better education? Join a team of youth interns from across NYC to organize a YOUth-Led Summit on Education Justice, Art, and Activism! We’re looking for artists, organizers, strategic thinkers, social-media aces, and tech-savvy woke folx between the ages of 15-20. No experience necessary. Eligibility: NYC youth between ages of 15-20. Sponsored by: Allies in Education: Building Coalitions for Youth-Driven Research and Advocacy research team as part of the Mellon Seminar on Public Engagement and Collaborative Research from the Center for the Humanities at the Graduate Center, CUNY. Click here to learn more about this call for interns and to apply. The International Rescue Committee (IRC) responds to the world’s worst humanitarian crises and helps people whose lives and livelihoods are shattered by conflict and disaster to survive, recover, and gain control of their lives. Founded in 1933 at the request of Albert Einstein, the IRC works with people forced to flee from war, conflict and disaster and the host communities which support them, as well as those who remain within their homes and communities. At work today in over 40 countries and 26 U.S. cities, we improve outcomes in the areas of health, safety, economic wellbeing, education and power. Given the disparity faced by women and girls, we specifically seek to narrow inequalities in the outcomes we seek, and to ensure that women and girls achieve equally to men and boys. The IRC is examining the evidence-base available underpinning key interventions in a variety of sectors in development and conflict contexts as part of strategic planning, and is working to use this evidence to systematically improve our decision-making. The IRC’s Research, Evaluation, and Learning Unit is leading this effort. The Evidence to Action Intern will assist in searching for, analyzing, and synthesizing research evidence for the purposes of improving IRC’s programs. This work directly feeds into the IRC’s efforts to become an outcomes-driven and evidence-based organization, and will allow us to rapidly prototype and adapt various evidence synthesis products that can feed directly into decision-making by our staff as well as external stakeholders. The intern will report to the Officer, Evidence to Action. This position is part time, and will start on or around June 8th and will end on or around August 24th. Education: Pursuing or recently graduated bachelor’s or master’s degree in a Social Science or other relevant field. Work Experience: Previous experience as a research assistant, experience with literature reviews, or report writing. Demonstrated Skills and Competencies: Ability to carry out searches for research evidence. Ability to write straightforward summaries of research findings. Detail-oriented, ability to enter data into Excel. The City University of New York is pleased to announce an exciting partnership with Governor Andrew Cuomo! Launching in summer 2018, CUNY Service Corps – Puerto Rico will enable students at CUNY to play a meaningful role in The New York Stands with Puerto Rico Recovery and Rebuilding Effort. The State of New York is mobilizing students from both CUNY and SUNY to travel to Puerto Rico this summer and work with non-profit organizations already rebuilding on the ground. The Service Corps is looking for motivated, hard-working students to be a part of this service community. The program will operate from mid-June to early August in Puerto Rico. Exact dates will be available soon. Students must have the required documentation to travel to Puerto Rico. Examples include a U.S. passport, state-issued driver’s license, state-issued photo identification card, U.S. passport card, US military ID, or a permanent resident card. Students must be able to commit to a 2-week, 4-week or 6-week service project. Students who apply will be asked to indicate their availability in 2-week blocks during the program. The Natural Areas Conservancy (NAC) will lead an ecological assessment of the natural resources of NYC Parks. Student interns will be trained and will work under the supervision of NAC ecologists. All interns will collect vegetation and site condition data in forests, wetlands, and grasslands. This position is approximately 90% field work (outdoors) and 10% office work. Statement of interest & career goals (SICG). Please indicate the Borough(s) in which you are willing to work. The College Board is a mission-driven not-for-profit organization that connects students to college success and opportunity. Each year, the College Board helps more than seven million students prepare for a successful transition to college through programs and services in college readiness and college success — including the SAT and the Advanced Placement Program. The College Board’s Internship Program is an exciting chance to develop new skills while contributing to an organization that is committed to the transformation of education in America through college readiness for all students. The Internship Program presents a unique opportunity to highly talented students who wish to develop strengths in core skills, and to obtain real-world work experience. The College Board is committed to our Internship Program and ensures that each student receives mentoring, experiences a variety of assignments that allow for collaboration with diverse groups across the organization, and focuses on defined deliverables. – Assist in building the concept and provide market analysis for a campaign designed to target students who are the first in their respective families to attend college, as well as the organizations and constituents that support those students. – Support the creation of a toolkit designed to target students and their families in the college planning process. – Support the efforts of the SMS texting pilot and virtual advising campaign targeting students. Assist in the process of content development. – Participate in the work associated with our Annual Fall mailing. Assist content experts to define / refine the mailing components. Support the development of corresponding counselor treatments as well as post-campaign analysis. If you are interested in an Internship at the College Board and you meet our qualifications, please apply by visiting our Careers page at www.collegeboard.org/careers. No phone calls will be accepted. All resumes must have G.P.A and expected graduation dates.